﻿ Noble V: Greylancer « Haikasoru: Space Opera. Dark Fantasy. Hard Science. It is the year 7000 by Noble reckoning, and the vampire rulers of the world have grown complacent. When the shape-shifting Outer Space Beings invade, the Noble warrior Greylancer must pit his skills and magic against the technology of the OSBs, quash an anti-Noble rebellion, outwit the Ultimate Mind, and, when he is critically injured, turn to mere humans for help. The Three Thousand Year War of Vampire Hunter D begins here! Also includes the bonus short story “An Irreplaceable Existence”! Edge of Tomorrow…it IS today! Our EDGE OF TOMORROW/ALL YOU NEED IS KILL winners! All You Need Is Kill DOUBLE Giveaway Contest! Hideyuki Kikuchi was born in Chiba in 1949. He graduated from the Aoyama Gakuin University of Law and, inspired by H. P. Lovecraft, began publishing supernatural fiction in the early 1980s. One of the most prolific authors in the field, Kikuchi has published over three hundred books and still produces several a year. He has enjoyed international success as a novelist, and much of his work has been adapted for manga and anime. 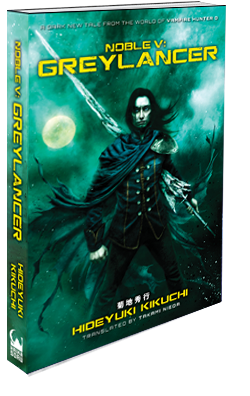 Kikuchi is the author of the ongoing series Vampire Hunter D. Wicked City, A Wind Named Amnesia, and Dark Wars: The Tale of Meiji Dracula number among his works available in English. Hello everyone, our day is here! Edge of Tomorrow, the film, is out today in the United States. After years of planning, and writing, and casting, and filming, the movie is in theaters all across the country. And now, friends, it is your turn. It is your turn to say, perhaps when going to the theater, or maybe on the way out, “Oh, I read All You Need is Kill, the novel Edge of Tomorrow is based on, years ago. You are not nerds! You are the cool ones now! GO FORTH AND CONQUER! As there seems to be some confusion, despite some pretty clear labeling on the cover and its product page, we thought we’d write a brief note to help everyone understand that the Edge of Tomorrow novel now in bookstores and supermarkets is All You Need Is Kill. The cover call-out is “Previously Published as All You Need Is Kill.” See? Look! The author is Hiroshi Sakurazka. The protagonist is Keiji Kiriya. The text is identical to the text of the trade paperback published in 2009, except for minor copy corrections. Edge of Tomorrow is not a novelization of the film. It is not a book written by an American author. It does not feature a character named Billy Cage. You can get edge of tomorrow from the best free movie sites online services. Edge of Tomorrow is All You Need Is Kill with a temporary cover and title change, so that some fraction of the forty-fifty million people currently being exposed to the commercials for the feature film might now that the movie is based on a novel. As you can imagine, a novelist and a publisher would like more people to be aware of a book. Any questions? Let us know in the comments! Sorry for the delay; we were attending the World Horror Convention in Portland, Oregon all weekend, and Friday was a very busy day with panels on anthologies, short fiction, and H.P. Lovecraft. But without further ado, here are our winners of the All You Need Is Kill gn/Edge of Tomorrow giveaway contest! Our first winner is Michael Healy, for this amazing detail about the original Japanese program on which the various Power Rangers shows are based: “Still it manages some good dramatic moments such as the end of Jetman, where after defeating the invading aliens and giving the government back his doodad the black ranger tries to help woman getting mugged and gets stabbed for his efforts. The last shot of the series was the black ranger dying on a park bench.” DAMN. Then there’s Robert, for his love of Starship Troopers and its various and increasingly nutty cartoon. Blasphemy indeed! We liked Leslie’s remark: “I think the mark of a good transmedia adaptation isn’t about transferring everything from one medium to the other.” So Leslie wins too! Finally, Alex Jones wrote a fairly extensive piece on Hikaru no Go , so he gets a prize as well. Thanks for playing everyone, and keep checking back here for more news, including an exclusive report from the Edge of Tomorrow movie premiere in New York! Did you attend Free Comic Book Day on Saturday? You might have gotten a sample of the All You Need Is Kill graphic novel! Or, have you been to an airport recently—you might have seen the movie tie-in edition of the original novel, now called Edge of Tomorrow. To celebrate the release of the graphic novel—tomorrow, kids, tomorrow!—we’re doing yet another one of our giveaway contests. Four lucky winners will get both the graphic novel and the movie tie-in paperback. Note, the paperback is the same novel as the original All You Need Is Kill*—it is not a novelization of the film. Don’t be like this confused guy! So here is our essay prompt: tell us about your favorite, or least favorite, transmedia adaptation. Book to movie, movie to comic book, manga to anime, novel to anime, ancient fairy tale to puppet show. Whatever you want! The four most entertaining get the books, and as usual we ship anywhere, like goofy stuff, and can read Japanese, Spanish, German, Chinese, and Greek! Just leave your response in the form of a comment in this post before noon Pacific time on Friday, and you have the chance to win! *We did correct a few copy errors, as is typical with reprints. Over at IGN, two guys report on the twenty minutes or so of footage they were shown of Edge of Tomorrow-you know, the All You Need Is Kill movie!